We’d love your help. 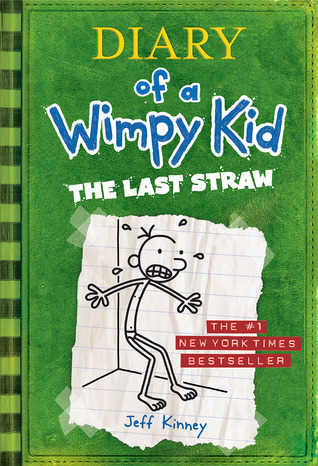 Let us know what’s wrong with this preview of The Last Straw by Jeff Kinney. To ask other readers questions about The Last Straw, please sign up. i want to read this how can i? Casey Terryn It is probably at a library. why is it sooooooooooooooooooooooooooooooo funny ? i want to read this book soooooooooooooo bad because the first 2 were pretty funny. i cant wait!!!!!!!!!!!!!!!!!!! There was a part that had me seriously laughing so hard. (I am not giving anything away here, it will just be much funnier when you read it yourself) Greg had gone to I never tire of this series. I just think the humor is so right on! I read often that the book appeals to reluctant readers and I would seriously challenge that. It appeals to ALL readers in fifth grade. Let's face it, we were all a "Greg Heffley" in fifth grade. Unless of course you were a "Rowley" in which case, I am very sorry. The wimpy kid books never fail to make me laugh. Kinney has a great sense of comic timing in these books and the pictures really do make the story what it is. What bothers me about these books is the main character's attitude and the way he treats others. I hope that kids see that the reason Greg gets himself into trouble all the time is because of his attitude. 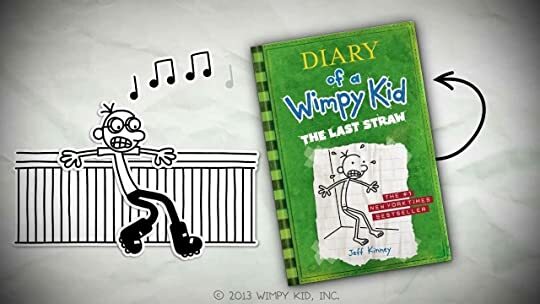 Instead of looking up to him, it's my hope that kids who read this book say, "Man, if Greg just treated people with a little more respec The wimpy kid books never fail to make me laugh. Kinney has a great sense of comic timing in these books and the pictures really do make the story what it is. What bothers me about these books is the main character's attitude and the way he treats others. I hope that kids see that the reason Greg gets himself into trouble all the time is because of his attitude. Instead of looking up to him, it's my hope that kids who read this book say, "Man, if Greg just treated people with a little more respect then maybe he wouldn't always get himself into these bad situations." When Greg's father threatens to send Greg to a military academy, Greg must find a way to prevent this from happening. Every once in a while you need a break from wizard boys, sparkling vampires, conspiracy theories, go-nowhere love stories, end-of-the-world page turners and the never ending stream of parallel worlds. Every once in a while you need to forget that you are a full-blown adult whose literary tastes are mature and discerning and who, to put it mildly is a bit up-yourself. Every once in a while, you need to escape into the world of a Wimpy middle-school Kid who is high on smarts and low on luck. It’s tim Every once in a while you need a break from wizard boys, sparkling vampires, conspiracy theories, go-nowhere love stories, end-of-the-world page turners and the never ending stream of parallel worlds. It’s time to hold your breath over the unwashed clothes and dodge the well-meaning parents and stumble over the boogers as you venture into the world of Greg Heffley. Greg Heffley’s astounding schemes and equally mind-boggling failures continue. His chief bête noire in this book is his long-suffering dad. Greg’s father wants to make a man out of his dandelion-blowing son. To achieve this admirable goal, he is intent on sending Greg off to a military academy. This doesn’t sit well with Mr.Wimpy, who was looking forward to a summer of playing video-games and sleeping....snarfing down junk-food and sleeping....hooking up with the pretty Holly Hills and yep, catching up on some more sleep. The Wimpy Kid series may be considered juvenile and trite. But it’s entertaining and you read it with a constant smile playing on your lips. Sometimes you even snort with glee (well, I did). I say, regardless of your age....pick it up for some instant laughs, dry humour and a cast of characters that is so unbelievably well put together that you can’t help but stay hooked. I read this one, with my nine-year-old brother. He is such a big fan of the series and i always enjoy reading by his side. This series is a highly entertaining collection of books that offer much laugh, but notably not much, educationally speaking. That is not such a big deal, if you know exactly why you are reading a book. There are not all of them about inspiration and highly profound meanings. Some plain, simple fun is well needed too, and those books will provide just that. Maybe if y 3,5 Stars. Maybe if you give it some thought, though, you might come to the conclussion and form a more complex idea, that those books are a rough guide of what not to do if you are a boy that age. Now that is highly pedagogic. So i had a good time reading it, i chuckled and rolled my eyes in the stupidity that still torments Greg and it was all ok..
- I don't like his parents..
- The jovial plot is always a plus. - My brother loved it. - It was very enjoyable and fun, easy to read. If you've enjoyed Diary of a Wimpy Kid #1, you should definitely follow the series because it keeps getting hilarious with each installment. Greg Heffley continues with his hilarious journal. It seems that he has now become accustomed to writing it, because there are no gripes about that in this book. Or maybe it is because he has much more serious things to worry about... like the school soccer team and military school. Dad is determined to make a man out of Greg. Greg is quite happy to stay a wimp, playing with the latest video games and trying to impress the beautiful Holly Hills. 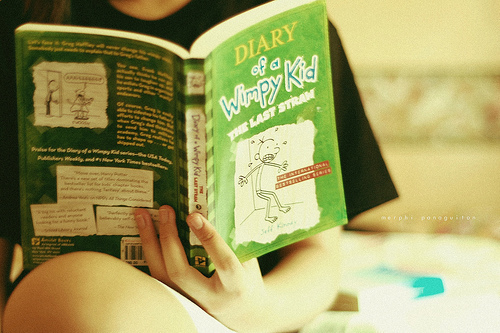 However, being the kind of person he is, Greg finds Greg Heffley continues with his hilarious journal. It seems that he has now become accustomed to writing it, because there are no gripes about that in this book. Or maybe it is because he has much more serious things to worry about... like the school soccer team and military school. Dad is determined to make a man out of Greg. Greg is quite happy to stay a wimp, playing with the latest video games and trying to impress the beautiful Holly Hills. However, being the kind of person he is, Greg finds it difficult to attack the problem outright. The only method open to him is subterfuge. Two-thirds of the book recounts Greg's ineffectual attempts to get out of the soccer team and his equally ineffectual attempts to befriend Holly Hills. He uses Rowley quite shamelessly whenever he feels it would give him an advantage: however, Rowley almost always comes out on top without even trying! We cannot blame Greg for feeling that life is unfair to him. However, fate takes a hand, and Greg escapes by a hair's breadth. How that happens is narrated in his own inimitable way by Jeff Kinney, and is the highlight of the book. It is guaranteed to leave you in stitches. In this novel, we see Greg slowly forming a bond with his Dad, who we find is not very different from his son. It is quite possible that Greg will grow up to be just like his father. And for a change, the novel ends on a happy note, because Greg has run out of pages immediately after being befriended by the gorgeous Trista, the new girl in the neighbourhood. And we are also happy, because despite all his cowardly traits, Greg Heffley is a lovable kid. Greg, the main character of this incredibly funny series, is a middle schooler whose universe revolves around him. He was quite selfish in the first two books. But that was nothing. Greg is reaching the pinnacle of selfishness in this book. He always has an idea how to benefit himself even if it hurts someone else inclusing his best friend or family members. But there still is karma in the world (Greg doesn't know about it). This might be the funniest book in the series so far. Loved it! Meh! Not bad, I always get through these real quick, but it wasn't funny or anything, and Greg really gets on my nerves sometimes. Especially when it comes to how he treats Rowley. I heard about this series from NPR and decided to get the first one for my boy. I'm glad I got it. It's honest, clever, funny, and sweet without being nauseatingly so. I understand the character and his "uniquenesses". He reminds me of Charlie Brown except for one major difference. The main character accepts himself without all the self depricating self-analyzation. "I am the best person I have ever known." I love nerds. Typical mayhem ensues, Gregory and Rodrick and the rest of the Heffley family yuck it up as the "wimpy kid" continues to behave in the same self-serving manners which could possibly land him in military school. I think this is a cute series, just right for my oldest sons age group. Not only is it funny, but at times we find ourselves stopping and discussing what a spoiled rotten kid Greg is!! Fun and easy read, entertaining and light- it's a book you can take not too seriously. It's something you can rely on during quick breaks or waiting for a ride. I was torn between giving this 4 and 5 stars so I thought I just rate it in between. I like this series but this particular installment didn't make me burst out laughing, unlike the first two books. This issue tackles Greg's being wimpy in sports and being not man enough so I can't relate that much. Maybe male readers and followers of this series could appreciate this 3rd book. DEEEELIGHTFUL. Favorite parts: Shel Silverstein boogeyman (amazing), hiding-under-the-blanket-next-to-his-dad-when-the-phone-rings (so easy to picture actually happening, so dumb, so annoying, so funny), and the image of Greg in his glasses, Rowley in his ...spaceman suit? and Mrs. Heffley in the front seat of the car. Kids are so ridiculous, and their parents just let 'em be. These books are just so hilariously honest. Greg is kind of horrible, but so is everyone around him. Really loved the fake swear words in this one: Plastic raspberry tickle bear! Goodness! I have been chanting for sooo long that I will write all my pending reviews after exam. But I just can not stop devouring books!!! It feels so good to just hold the novels in my hand and not inside a textbook in a respectable time of the day unlike 2 in the night. Plus, I hate having unread books in my shelf. It feels so good to see its size depleting. Arghh, okay, I promise, 3 days of wild, carnal book reading marathon and then I am done. Greg Heffley and his family are back and Greg is trying to get up the courage to ask out a girl while trying to keep himself out of military school. The new Wimpy Kid is enjoyable and more of the same. That isn't a bad thing, but it would have been nice have more of an explosive ending like the others. The part about Shel Silverstein made me laugh because I remember thinking the same thing from his picture on the back of Where the Sidewalk Ends. I was surprised to find out that this book was not nearly as good as the first two Diary of a Wimpy Kid books. I did not enjoy as much as the other two because the humor that kept me hooked was almost completely gone and the book was more focused on getting the attention of a girl. i hope the next book will be better. I shall write a comprehensive review for all books upon completion of the series. This book is the the 3rd book that Jeff Kinney wrote in all his "Diary of a Wimpy Kid"s . It's actually more interesting than the first 2. Greg was finally planning what to do in his summer holiday because summer is in the next 5 weeks. All he plans to do mainly is to play the game "Twisted Wizard 2" and get close to a girl named Holly Elizabeth Hills. But his dad, Frank Heffley, heard the rumors about his plans and didn't appreciate it. He told Greg that he needed to be more strong like the oth This book is the the 3rd book that Jeff Kinney wrote in all his "Diary of a Wimpy Kid"s . It's actually more interesting than the first 2. Greg was finally planning what to do in his summer holiday because summer is in the next 5 weeks. All he plans to do mainly is to play the game "Twisted Wizard 2" and get close to a girl named Holly Elizabeth Hills. But his dad, Frank Heffley, heard the rumors about his plans and didn't appreciate it. He told Greg that he needed to be more strong like the others in the neighborhood so Frank is going to send him to a military school called "Spag Union". Diary of a wimpy kid was about a boy named Greg Heffley that has the worst life.First he makes a new year resolution but it doesn't work out.Then he has to join a soccer team but he really is bad at it so his dad makes go to a boot camp for all of summer so he wants to make the most of the time he has.I like this book because it gives a lot of detail and fells like your really there in the book.I would recommend this book who like to laugh at people. This instalment in the series wasn't particularly great, nothing new all very similar to the previous books. What happens in this one, Greg avoids doing laundry, Greg fancies a girl, Greg is rude, Greg is mean, Greg doesn't learn any lessons but all works out in the end. Warning, this book does feature the word Ploopy....thought I'd mention it incase you are crazy easily offended. My daughter really enjoyed this one though. Don't think many parents are going to get much out of it. My son recommended these books to me. My son has been surfing with his dad in San Diego for a week and a half now. When I finished the 2nd book I called and him told my favorite part was when the grandpa handed Greg his false teeth. My son cracked up and said that was his favorite part too. I miss my son so friggen much I feel like crying! “There was this book Dad used to read to me every night called "The Giving Tree." It was a really good book, but the back of it had a picture of the author, this guy named Shel Silverstein. But Shel Silverstein looks more like a burglar or a pirate than a guy who should be writing books for kids. Dad must have known that picture kind of freaked me out, because one night after I got out of bed, Dad said: "IF YOU GET OUT OF BED AGAIN TONIGHT, YOU'LL PROBABLY RUN INTO SHEL SILVERSTEIN IN THE HALLWAY."